As the name suggests, a predefined firewall policy is a set of one or more individual network control rules that have been saved and can be re-used and deployed on multiple applications. Note: This section is for advanced and experienced users. If you are a novice user or are new to Comodo Firewall, we advise you first read the explanations for Network Security Policies, if you have not already done so. 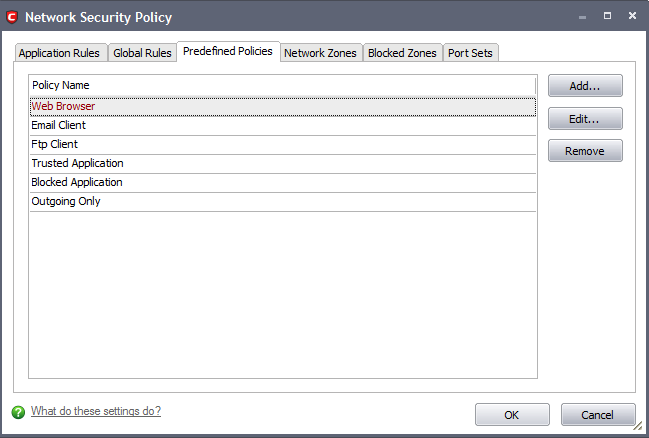 Click 'Predefined Policies' tab from Firewall Tasks > Network Security Policy interface. Details of the process from this point on can be found here. Click the 'Add...' button. This launches the policy creation dialog shown below. As this is a new predefined policy, you need to name it in the text field at the top. It is advised that you choose a name that accurately describes the category/type of application you wish to define policy for. Next you should add and configure the individual rules for this policy. See 'Adding and Editing a Network Control Rule' for more advice on this. 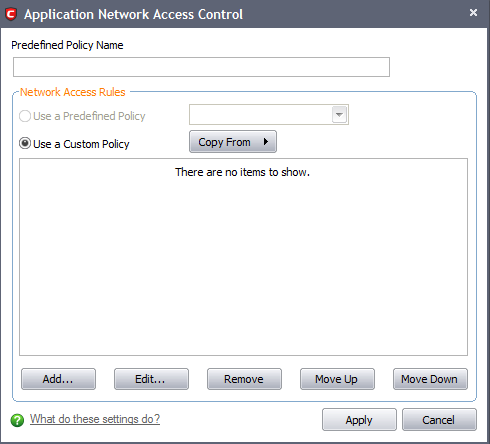 Once created, this policy can be quickly called as a 'Predefined Policy' when creating or modifying a network policy.